For example, you might be putting together some slides for an event or business seminar, and you would like to display something at the start of the presentation that says when the session will start, and what the current time is (like the slide to the left). 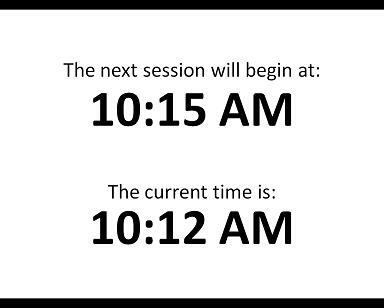 For example, pilule you might be putting together some slides for an event or business seminar, this and you would like to display something at the start of the presentation that says when the session will start, mind and what the current time is (like the slide to the left). 2) Look for the "Presentation Views" group and click on "Slide Master"
5) Look for the "Text" group, and click on "Date & Time"
7) Click "Apply to All"
9) Click on the "Slide Master" tab in the ribbon, and then click on "Close Master View"
2) Look for the "Text" group, and click on "Date & Time"
4) Click "Apply to All"
So are you at School, steroids College, human enhancement University or other Education Institution and have just upgraded to Office 2007? Are you getting stuck on those education specific things like References, infertility Bibliographies, Footnotes, Citations and more? Well here is a quick guide to help you with your next assignment. In Word 2007, all of these features are grouped together under the "References" tab on the Ribbon. In almost every project or assignment you will need a Table of Contents. In Word 2007, creating a table of contents is really easy – in fact it will do it automatically for you – as long as you do one thing whilst you type your document… use heading styles. You know what I am talking about – Heading 1, Heading 2, Heading 3 and so on. You can find them on the "Home" tab of the Ribbon. Word 2007 is smart enough to figure out that because you set a certain part of your text as "Heading 1" for example, that it is important enough to be a entry in your tale of contents! So you want to use Footnotes to tell your teacher/lecturer/professor/reader about the source of certain facts or opinions which you have used in your assignment? Well in Word 2007 it is REALLY easy! 5) Type in your footnote! Back when I was in high school, I used to hate writing my Bibliographies! It was just too complicated. And then when the teachers told me about different ways you could write them – they made it even worse! Luckily Citations and Bibliographies in Word 2007 are really easy. Say you want to refer to a book somewhere in your assignment. 3) Click on "Insert Citation"
4) Click on "Add New Source"
On the box that pops up, there are a bunch of fields that you can fill in about the book you are referring to. To make sure the teachers do not come back at you for missing information, make sure you tick the box that says "Show All Bibliography Fields"
Once you fill in all the details about your book (most of which you will find on the inside cover), click OK. You will notice a citation appear in your document. If you have a pile of books that you know you are going to cite, and want their details into Word 2007 before you type too much, make sure you click on "Manage Sources" and add all the books or documents you like. Now if you want to cite a book you have already used – it gets even easier. Simply click on "Insert Citation" again, and you will notice all the books appear in the menu – just click on the book you want to cite and away you go! … but what about the Bibliography you say? Take that teacher! Bibliographies made EASY! Do you have pictures in your assignment? It is always good to put a caption near them to ensure your teacher or professor knows what the image is all about. 3) Click on "Insert Caption"
That was easy. But here is the easiest bit. If you need to include a "Table of Figures" in your assignment, all you need to do is click on "Insert Table of Figures" and look in awe at your amazing Word 2007 skills! So there you have it – The Student’s Guide to Word 2007. Hopefully the above tips will help you get that A+ on your next assignment!